I am not an activist. Growing up in the 1950s and 60s, I narrowly missed most of the great protest movements of my time, and I have stayed in my bubble of white privilege in the years since. But I have become uncomfortable. 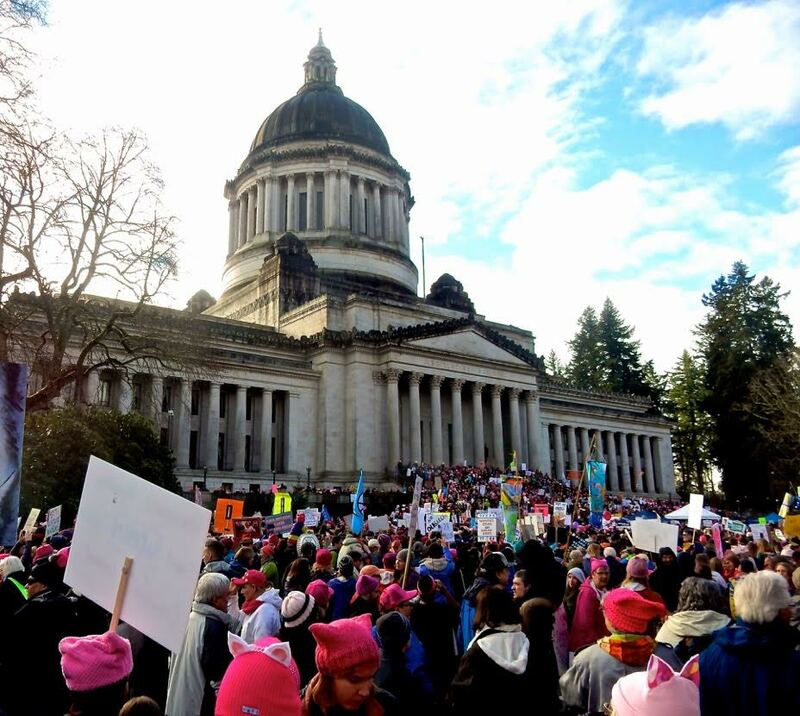 I was one of 10,000 at the Women’s March on Olympia, my state capitol. It was the day I became an activist. Marchers came out in the rain for many reasons, as indicated by the signs they carried. Their passion was palpable, but peaceful; they came in both outrage and love. Some, of course, were protesting the election. It gave me pause to reflect on my reason for being there. The election wasn’t what I hoped for, but it’s over and we must move on. I marched because I sense a threat to the rights and privileges guaranteed by our Constitution: freedom of the press, equal rights, freedom of religion. I marched because I fear the hard-won strides women have made toward equality will be erased. I marched because of hatred I hear in the rhetoric toward immigrants in America and those who will seek refuge here in the future. I marched for my daughter and her wife, to protect their marriage. I marched for my bullied transgender sisters and brothers. I marched for all who were not born into white privilege. I marched because I want to send a message that we live in a global society. As the greatest nation on earth, it is our responsibility to assist, to the full extent of our abilities, those countries whose people are struggling. I marched because I sense a threat to the strides that have been made to correct the damage we have been inflicting on Mother Earth for decades. The lives of my grandchildren and their grandchildren depend on what the generations of adults living now do about it. 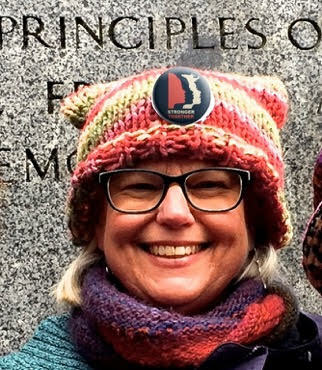 I marched for my 100-year-old mother whose generation suffered for the freedoms I enjoy. I marched for my four young grandsons who deserve the freedoms my generation fought for. I marched because I feel the moral core of our nation is under attack. I marched to join my voice with millions of women, men, and children around the world who marched in their own cities and towns. I marched to send a message to Congress that I am watching, that I am expecting them to do their job to represent their constituents and uphold the Constitution, even if it means opposing the administration. Saturday I stepped out of my comfort zone, and I’m not going back. My one day at the march, was only my first day. I have already acted beyond the march, writing to my legislator and giving money to organizations doing the work I want to see in the world. I am a citizen of the world. That which affects my sisters and brothers, affects me. I marched to show them and the world I care. And caring will change the world. Sunday hadn’t been a good day. Dan the Handyman had cancelled. Dan is the light in my mother’s life, and he helps her with her tape recorder, on which she’s telling her epic life story. Mama needs Dan to check the tape before she starts, to make sure she got what she thought she recorded. She doesn’t trust anyone else. It was a day-changer for both of us. Sunday morning she was sure she had taped more the day before than I could find, but that there was a long silence between words. She couldn’t explain why she thought that, and she didn’t appreciate my exploratory questions. “It’s on there!” she insisted. She didn’t understand that the end would be at the point where the tape was stopped, since it hadn’t been rewound. I hop-skipped through the tape to be sure. “Perhaps you were speaking, but the pause button was on,” I suggested, expressing my sympathy for this recurring problem. That evening I stood, unobserved, watching her in her chair. She looked so old, so weary, so alone sitting there. She looked so much like her mother at the end of her life my eyes welled up. My chest tightened, until I could hardly breathe. No matter how many people are around, the end of life is traveled alone. I wanted to pull her onto my lap, fold my arms around her tiny self and hold her to my bosom; like she once held me. I wanted to tell her I was so sorry. Sorry she had to still be alive, and not really living. Tell her she could stop working so hard to stay tethered here. Tell her to go find her true love. I’m reading the letters my father wrote over their long separation during World War Two. Sunday morning I read one from the summer of 1945. The war was over, but for the atomic bomb, but it would be seven more months before he shipped home. She continues to make the best of a bad situation, and increasingly the best falls far short of satisfactory. She told me some time ago she no longer believes in heaven, or reuniting with loved ones. I choose to imagine them together again, forgetting they were ever apart. Gretchen Staebler blogs at www.daughteronduty.wordpress.com about the education and frustration–and occasional humor–of living for the past nearly four years with her almost 100-year-old mother, and the déją vu of living again in her childhood home. Hopefully without losing her mind. Read this post in its entirety at Daughter on Duty. I return home from my small-town escape to the closest city for yoga, grocery shopping, the Farmers’ Market for fruit and a sweet treat for Mama’s breakfast, and Trader Joe’s to stock up on medicinal wine. It’s a weekly outing that keeps me sane. As I leave Olympia, I round the bend toward the I-5 exchange and as it does every time, Mt. Rainier reaches into my throat and grabs my breath away. For this, I moved across the country to care for my mother. I’m about to appreciate the reminder. I unload the car and take my purchases into the kitchen where Mama is hovering in the room that was always hers alone. I am still the child at my mother’s knee here. I get daily instructions on how to load the dishwasher, proper placement of the can opener in the drawer, and the best way to wipe up spills on the floor. 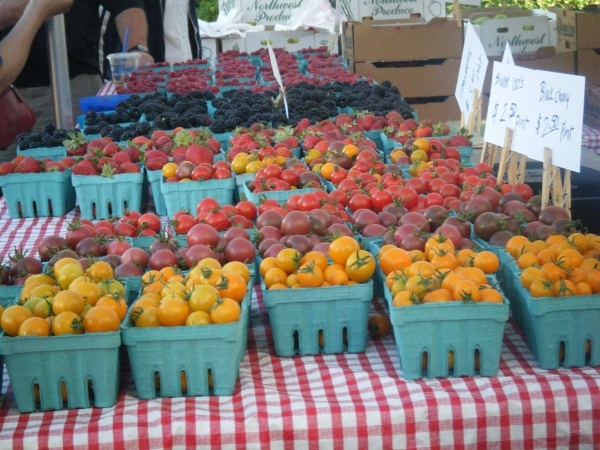 “I went to the Farmers’ Market,” I tell her, proud of my purchases, back to trying to please my mother, like I’m 15, not 60. “Did you get any good vegetables?” she asks, ignoring what I did get. Mama gasps, “You didn’t look for tomatoes? Always look for ‘good’ tomatoes!” I roll my eyes, which her lousy vision prevents her from seeing, but say nothing. I put away the groceries, then feed my cat and return to the kitchen. “There are also grape tomatoes in the refrigerator,” I say, irritated that things go to waste because she and her paid caregiver buy duplicates. Throwing the box–literally–into the back of the refrigerator, I explode, “Oh, for gawd’s sake!” Not letting it go, I add, “And here is a big tomato that is going bad.” I take it from the refrigerator and put it on the counter, resisting the urge to slam it. A few minutes later, Mama picks it up. “I just said it needs to be eaten. It has some bad spots,” I spit. Gretchen Staebler is a Pacific Northwest native, transplanted to the Southeast and back again 36 years later. She blogs at www.daughteronduty.wordpress.com about the education, frustration, and occasional humor of living for nearly four years with her almost 100-year-old mother, and the déją vu of living in her childhood home. Hopefully without losing her mind.